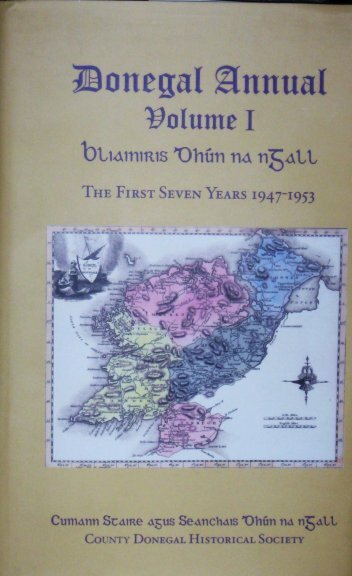 "Truly fabulous" was how Donegal County Manager, Mr. Seamus Neely, described the contents of the book which he launched in the County Council chamber on October 7th, 2011. He was referring to a major project undertaken by the Historical Society, ie the re-issuing of its first seven annuals in one volume. Emphasising the importance of the publication, Mr. Neely said that to understand where we're going we have to know where we've come from in order to establish our identity. He also noted that the Irish diaspora would find the volume of immense value and it would strengthen the bonds among us all, resulting in benefits for the tourism sector. Little did the founding fathers of the Society realise back at the inaugural meeting in this same chamber in December 1946 how the world would change in the decades to follow. For example, the launch made history in that it was the first event involving the Society to be streamed via live internet TV across the globe. Check the Council's website to see the launch.The early print runs were about 200, mainly in the county; today the Society membership edges towards the 1,000 mark with members all over the world. Speaker after speaker at the launch praised the Society for its immense contribution to the cultural life of the county, preserving and promoting Donegal's tremendously unique past. Browse through the pages of these seven annuals, scanned as they first appeared all those years ago, and you'll be in complete appreciation of the range and depth of the articles to be found there. Even the advertisements evoke a wonderful atmosphere of an era long gone. It is now available in the major bookshops. The good news is if you're far from the county we can send it on. It is available in HARDBACK (40 euro) and PAPERBACK (25 euro). Postage is extra. Click here for an application form to be returned to our Honorary Secretary, Mrs. Una McGarrigle 087221378. The launch ceremony in the County Council chamber was filmed and can now be viewed on the Council's own website. It also made history in being the first event involving the Society to be sent live via the internet world-wide. To see the video of the launch click here. 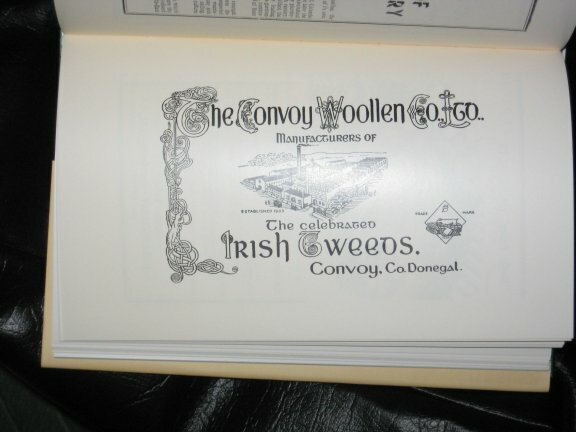 Photos below show the cover, some pages from the volume and an advertisement for Convoy Woollen Mill. Donegal in Song & Story by Venerable Archdeacon Kerr, P.P. Gortahork. Co. Donegal in Anglo Irish Literature.by J.C.T. MCDonagh. Notes on Shore Dwellers & Sandhill settlements by P.J. McGill. 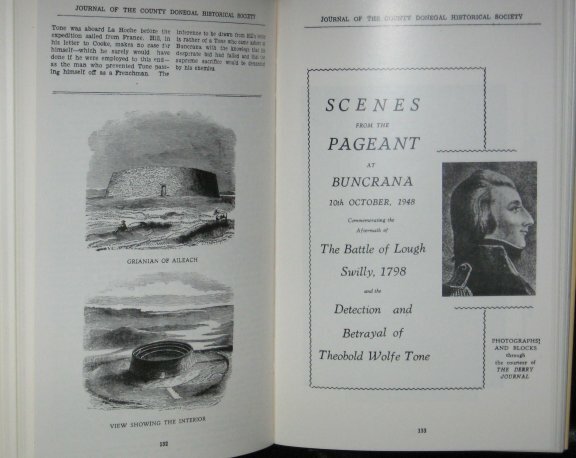 Bibliography of Co. Donegal by MacDonagh & McIntyre. Flints from the Lowry Collection by Prof. Owen Davis. Co. Donegal in Catholic Qualification Rolls (1778-1790) by Sean O’Domhnaill M.E. Kidnapping & Imprisonment of Red Hugh by Morwenna Donnelly, Essex.